Despite his very hectic schedule, Baruch Levine took a few minutes to spend some time discussing his latest release, Touched by a Niggun, with our very own JM Derech. 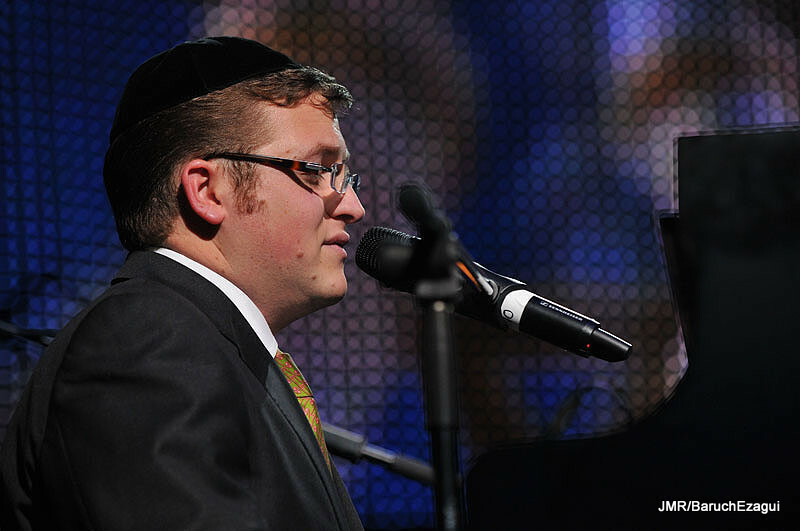 JMDerech: My favorite song was “The Piano”, the meaning of the song had the deepest impact on me, which song stirred up the most emotions within you and why? BL: I personally don’t particularly have a “favorite” song as there is so much that went into each one. Every song has a different message and I tried to do justice to each one by composing an appropriate “niggun” that would relay Rabbi Spero’s message correctly and with the proper feel. The feedback thus far really varies as to what the “favorites” are and I guess it depends very much on every persons unique challenges and what relates to them. Although being that I am a Rebbe I personally relate very much to “The Maggid’s Message” (track 8) which teaches us that even though it can seem like your efforts are sometimes not appreciated …you never know whose life you can change and no effort goes unrewarded..”yogati umatzasi Taamin“. JMDerech:You reused a couple of tunes on this album. Lecho Dodi from Yisroel Werdyger (Lecho Dodi), V’hoo Keli (A Child’s Prayer) from your first album and although probably not intended, Touched by a Niggun sounds like Kol Haberurim from your first album and The FaltchePhony Rebbe sounds like Sfashkenaz from Journeys 4. Was it your intention to use songs that sounded similar? If so, why? BL:Kol Haberuim is a completely different song. the only similarity is that they both start off as a ballad and then into a disco. Note for note however, they are completely different. Sfashkenaz as well is note for note completely different than the FaltchPhony Rebbe. They are both klezmer style songs that you would barely hear on a classical JM album and maybe that’s why you feel that they are similar. If we wouldn’t hear 2 or 3 discos on every album we wouldn’t discern between one and the other and we’d also think that they all sound the same. JMDerech:The Next Gadol Hador is beautiful, the problem is, it’s so sad that I can’t listen to it sometimes. How did you and Reb Spero instill such emotion into the song? Or better yet, what was your purpose for choosing this tearjerker? Lastly, can we find out who the Gadol Hador was in this story? JMDerech:Someone’s Child gets the blood pumping and is great listen for a car drive, it really gets your “Ahavas Yisroel” feeling going. Was this song one of the more fun songs to record? BL:Certainly a lot of fun (especially with the Lev Tahor doing back up vocals), but also one of the more challenging ones to write. It’s sometimes harder to get a message across in a fun and upbeat way rather than slow and emotional. If it got your “ahavas yisroel” going then you definitely tapped into the intended message. JMDerech:Flickering Lights – a story about Chanukah in a Russian cell, was it by coincidence that this album was released around Chanukah and featured this song? JMDerech:Tour of Yerushalayim – Very much like “Yerushalayim” from Journeys 3. Did that song inspire this song? JMDerech:How long of a process went into the making of this album? BL:It took over a year of a lot of hard work on behalf of Yochi Briskman, Rabbi Spero, and myself. There were many drafts and many edits before the final version. There are even some songs that we did not end up using. JMDerech:Was it hard fitting short stories into songs? BL:Yes, and in some cases where the story can be told in one stanza, the other stanzas would be used to apply the message of the story to our lives, like in “Flickering Lights” which talks about the deep message of Chanukah, and “Someones Child” where the message is arguably more profound than the story itself. You asked about fitting short stories into songs, however we found it harder to fit long stories into a song. A song like lecho dodi where there are many details to the story itself, we found quite challenging to come up with words and phrases that are cryptic yet give over enough information so that someone who has never heard the story can understand it. JMDerech:What made you select this album as your next album as opposed to another album like your previous two? BL:For one, although no one can write lyrics that are more inspiring than Dovid Hamelech or the Anshei kneses hagedola there are many people (especially young children and the unaffiliated) who simply do not understand the peirush hamilim of the songs and would derive more chizuk and inspiration from something in English. Secondly, an English song can sometimes be more powerful as it gives over a direct message, as opposed to Hebrew lyrics where the listener can derive varying kavanos and messages. Sometimes the same Hebrew words can be sung sad and slow or happy and fast, and yet both can be appropriate. JMDerech:Are there plans for Touched by a Niggun 2? BL:We are just catching our breath from this one. JMDerech:What was it like working with Lev Tahor? BL:They are extremely talented and a pleasure to work with. I hope they put out another Lev Tahor album soon. A lot of fun and laughs were had by all. JMDerech:What kind of feedback are you getting from this album? BL:B”h unbelievable. But if it inspires even one person to make a positive change in his/her life, or if it uplifts even one person who needs a little chizuk in his/her life it was all worthwhile. JMDerech:Do you have any suggestions for aspiring singers or composers? BL:Never lose focus of the bottom line that music is a powerful vehicle to get closer to Hashem and copying secular styles crosses lines that shouldn’t be crossed and takes the listener away from that focus. (I am not referring to music that is sometimes used for Kiruv) Proper composing is when one is inspired first by words and from his inspiration composes a tune that further “explains” the words of chazal, tehillim, or whatever they may be. JMDerech:What new singers do you find most interesting? BL:There is some new talent out there consisting of people who sing with a lot of “heartz“, keep Jewish music Jewish, and are ehrliche wonderful people. It would be inappropriate for me to single out anyone in particular.